I post some game reviews here, but I also write game reviews that appear on my own web site. I've been doing this for over a decade now, and I live in the iron grip of much shorter-lived habits than that, so I'm not going to abandon that page now. And I don't want to double-post everything. Up in the next couple of months: Sherlock Holmes: Nemesis. And now I will pass out, because I blew too many hours this evening playing Endgame: Singularity. This is a free casual Civ-style game which I found cute and clever. You're a newly-arisen AI, living in the Internet, trying to rent enough server space (under fake ID) to survive and grow. I usually avoid Civ games, but this one had sufficient chill factor to pull me in -- once. Keep in mind that I avoid Civ games because I like the exploration factor, which means I hate failing and starting over. In fact, I don't even care for succeeding and starting over. I grabbed Endgame in order to play it once, and I succeeded (thank you, Easy Mode), so it was all good. This is not a struggle of several AIs under symmetric rules. You are the AI. Your only enemy is the complacent herd of humanity: ignorant of your existence, and you'd better keep them that way, because if they find out about you, it's plug-pulling time. You set up computational bases on rented servers (and, eventually, larger facilities). Occasionally -- purely by chance -- one of your bases will be discovered and shut down. When this happens, humanity becomes more suspicious about Weird Stuff On The Internet; the more suspicious they get, the greater the chances of another base being discovered. You, in turn, can use your CPU and capital resources to research technologies to hide yourself better -- and, of course, to build better servers. 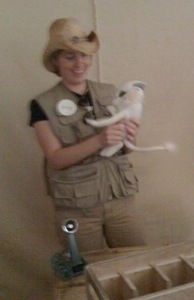 I also enjoyed feeling like I was a cross between Daniel Keys Moran's Ring and the bad guys from Odyssey 5. These are not virtues of Endgame, but riding a cultural wave is one of the things that games can succeed or fail at, and this one succeeds. Open-source smugness: Endgame is a GPL project written in Python. Maybe somebody will write that multi-AI struggle version someday. The iPhone App Store has opened, and it is time for all game-bloggers of good will to talk about iPhone games. Really, the only reason I post stuff on the Internet is to use the word "sodality" as often as possible. Thank you, Brannon Braga. But I'm interested in adventure games. 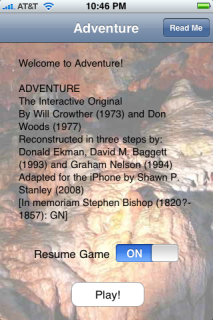 Adventures are a gaping hole in the iPhone lineup. Can this be? Surely adventures are common casual gaming fodder! Really -- do any web search on "room escape". Each of these games differs from Myst only in that it is small, indoors, and (usually) visually stylized rather than photorealistic. It is true that every one of these tiny adventurelets is written in Flash. And the iPhone has no Flash player. But heck -- every shooting, tapping, marbling, mazing, three-animal-clicking games on the Web is in Flash too, and developers had no trouble porting those to Mr. Shiny. The graphical adventure form needs few changes to run on a touch interface. You don't have the ability to click on tiny details -- but "hunt-the-pixel" was always the reductive failure of graphical adventures (as "guess-the-verb" is for text adventures). It's what happens when the game isn't working. So design your scenes for big hotspots. You don't have a cursor to change to indicate hotspots, either. Maybe dragging your finger around a scene should cause hotspots to flash, to indicate their existence that way. Or maybe you just need really good visual focus. This is important because graphical adventures normally have two levels of response: one indicates that you can use an item (cursor change), the other is for when you decide to use it (click). And so puzzles can involve a certain amount of "What do I want to do first?" If tapping something activates it, most of your game interactions are going to be accidental. ("Hey, I guess that was a lever!") That's a big rethink of the form. Maybe we should roll with the dragging idea: design most of the game elements to require motion rather than tapping. Tapping just causes a quick bounce or jiggle reaction. So if you tap on a cabinet door, it jiggles; that tells you that you can drag it open. I like this idea, actually. Levers everywhere instead of buttons. Drag the carpet back to look under it. Drag found items to your inventory, then drag them back to target hotspots. I'm not sure whether edge buttons or flick-scrolling is better for turning left and right -- that will require some testing. (If finger dragging gets coopted for one of the above ideas, I guess you're forced to use edge buttons.) Pinch-zoom seems like a clever idea for close inspection of scenes, but I suspect it will work best in moderation -- closeups only. 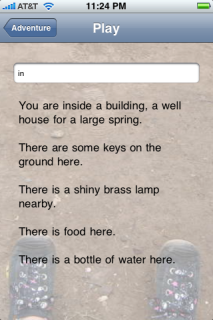 The App Store already has a text adventure -- the text adventure. This is a freeware application being distributed by "Pi-Soft Consulting" (which looks like it's the same as Shawn P. Stanley). A bit of historic neepery which will be of interest to practically nobody: the splash text shown above is misleading. It is taken from Graham Nelson's Inform port of Adventure -- which, as the note says, is adapted from Dave Baggett's TADS version of Don Ekman's Fortran source code. Which is fine, except that Shawn P. Stanley didn't use Graham Nelson's port. He adapted Jim Gillogly's C source code. This also descends from the Fortran version. The two versions feel rather different. Were one to play Graham Nelson's version of the game, one would find a refined parser supporting features such as "get all", more synonyms, abbreviations like "x" for "examine", and a long historical introduction. Gillogly's port uses the original, simplistic parser. There are a few gameplay differences as well. On the other hand, it's the same game. Both versions cover the classic "350-point" Crowther&Woods edition of Adventure, as opposed to any of several extended remixes. I just don't get why Stanley chose to write his credits this way. On both hands, the dedication to Stephen Bishop is appropriate to any version of Adventure. Let's take a look at the game itself. The interface is straightforward. You have an input line. When you tap on it, the usual iPhone tap keyboard appears, and you type your command. Hit Return and see what happens. Well, perhaps not so straightforward. This implementation only shows the response to your most recent command. There is no scrolling game history, such as IF players are used to. If you type "get lamp" at the prompt above, the visible text changes to the single word "OK" -- poor context at best. The obvious fix is to move the input line to the bottom of the screen, and show the game history above it. Right? Wrong. The iPhone really wants the input line near the top of the screen, because the keyboard is always at the bottom. If the input line is at the bottom edge, it'll just slide uphill when the keyboard pops up, and that wouldn't be great. What else does the perfect iPhone IF application have? I'll move away from criticizing iPhone Advent, and talk about general features. The splash page should have a "how to play" button. The mainframe-style "Do you want instructions?" when you start is all wrong. PDA IF traditionally has some kind of "tap a word to paste it" interface. I want that but it's hard to do with a touch-screen, because words are tiny. The ideal solution might be to invisibly mark up the output text with "this word is important" spans. That opens up a certain amount of blind hunt-the-pixel exploration, but if brute force is tedious and generally useless -- ie, if only the obviously important words are marked -- I don't think it would sidetrack players. However, what would be even keener would be a map. (I like drawing my own maps, but mobile IF players probably don't have a sheaf of blank paper handy.) Not a complete map, but one that's filled in as you play. You can see the nearby rooms that's you've already explored. You wouldn't want text on it -- it is, after all, behind the game text, and text on text is hard to read. 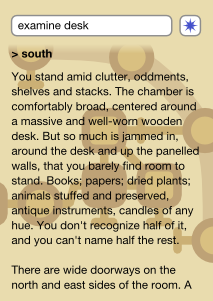 But a dynamic room map in unlabelled, simple shapes and low-contrast color would be cool. Highlight the current room (or keep it centered). This image is my quick sketch of the concept. Maybe it works? Maybe I'm nuts? Too bright yellow, for sure, but it's late so that's what you get. I played through Portal yesterday. jmac: So did you enjoy portal? zarf: I should make a Gameshelf post, but it would be a one-liner. I finished the game off at 2:30 AM, so you should be wary of my ability to get nouns and verbs in the same sentence, much less be original. But I appreciate the vote of confidence. That damn song is stuck in my head, but that's been happening on and off since it first hit YouTube. I don't blame you. I don't hate you. Shutting down.